Sometimes, what might seem like a brilliant blog idea can lose momentum and fade away if we don’t just sit down and write it. Looking through many photos of our cooking we’re amazed at how many missed opportunities have gotten away from us – great ideas unwritten and unpublished. So to make amends we’re finally getting around to writing and publishing a blog that we started several months ago. We figure since the guy that predicted the rapture was wrong–twice, we have time to prepare for the next BIG party. Back in May, the day before the “first” rapture was supposed to happen, Jason was in our kitchen making a big batch of grilled cheese sandwiches for an Artist Opening at Zannah Noe‘s Velcrow Studio. Making the sandwiches took hours, and as the time went by Jason thought about the type of food one would serve at a rapture party. We’re Gleeks (we’ve seen all the Glee episodes multiple times) and it seemed obvious to Jason that Grilled Cheesus would not only be the ultimate rapture food, but it would coincide with the season finale of Glee–assuming we were all still here. Alas, the season ended, the world didn’t, summer rolled over us like a truck and here we are, approaching Halloween, and this darned grilled cheese post is just now seeing the light of day. 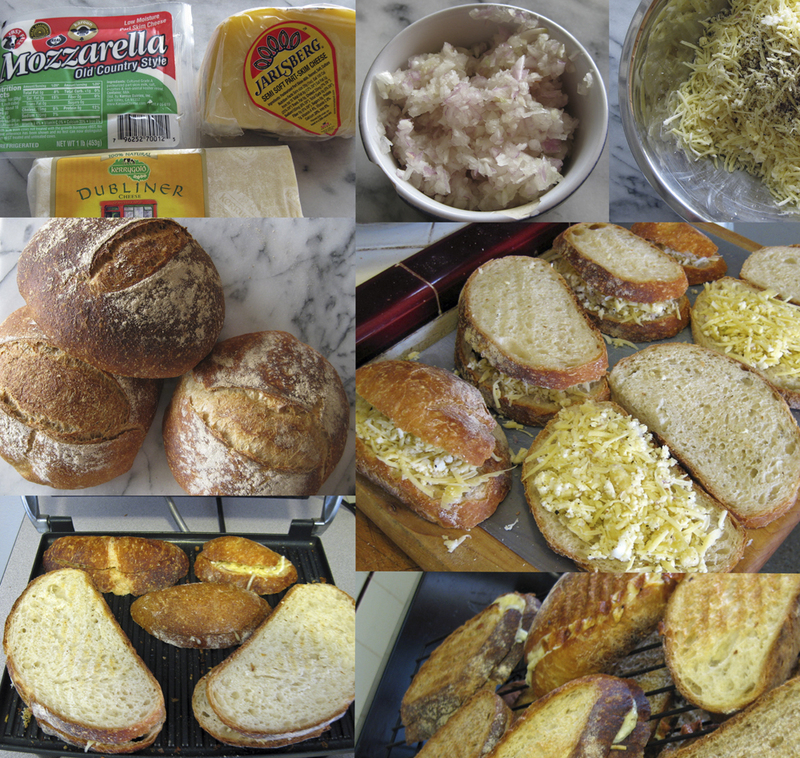 All the fixings for the ultimate grilled cheese. So now we’re in our kitchen prepping more sandwiches again, for Zannah Noe’s Open Studio on Saturday, October 29, TODAY! We will be at her studio with our panini maker, bread, and lots of cheese. The Ultimate Grilled Cheese is a Ruth Reichl recipe that we fell in love with after seeing it on the PBS holiday special, A Moveable Feast, which featured several cooking show hosts preparing their favorite holiday food. Ruth’s grilled cheese sandwiches are wonderful and adaptable to any, and all, cheese. The point is to experiment. With All Hallows Eve only a couple days away, and the holidays fast approaching, if you need a quick and easy appetizer that everyone will love, try the ultimate grilled cheese sandwich. They are so good that if the rapture does happen these sandwiches will be your ticket to Heaven. Mix the shredded cheeses with the onion, shallot, garlic, and ground pepper. Place between two slices of bread using a panini maker to grill the sandwiches, or butter both sides of the sandwich and lightly grill in a skillet over medium low heat. Let’s assume that if you’re reading our blog you’re a foodie, right? Which means that you don’t have a can of Kraft Parmesan cheese in the refrigerator and that you most likely have a wedge of Grana Padano, or another type of parmesan cheese, that you use on a regular basis. And if you don’t know the difference it’s time that you do a bit of homework on the world of cheeses and visit your nearest cheese shop, or at least go online and do some research. Cheese should never come in a can, and don’t get us started on Cheeze Whiz. If you have a can of that crap in your fridge you have some serious food hang-ups and there’s probably nothing we can do to help you. So stop reading and just leave, just kidding. But seriously, get up from your computer and get rid of that can of Cheeze Whiz now. We purchase Grana Padano from Costco, and while it is a large wedge it also lasts us for months. The best way we have found to store it is in a plastic bag (we are looking for an alternative, but as of today, it’s the best solution), within a plastic box (again, looking for an alternative) in the fridge. The plastic box has become our cheese drawer. It allows moisture to remain at a minimum while also keeping the cheeses fresh, and since Grana Padano is in the hard cheese category you’ll want minimal moisture. We use the cheese with anything from pastas, soups, breads, sandwiches, and anything that parmesan cheese is used for you can use Grana Padano. It has a nutty, sharp flavor that intensifies any dish. When we get down to the rinds, something most people would just throw away, we freeze them and use them for soup stock. The flavor is so intense and wonderful and the soup is so rich that all you need is a small cup to be satisfied, although you’ll be tempted to eat a large bowl. The cost of the soup is also so economical that it literally costs less than a can of Campbell’s soup to make. If you have a pressure cooker it will take very little time to create. If you don’t have one you can use canned beans or soak dried beans overnight but it will take a lot more time, and the flavors won’t be the same. 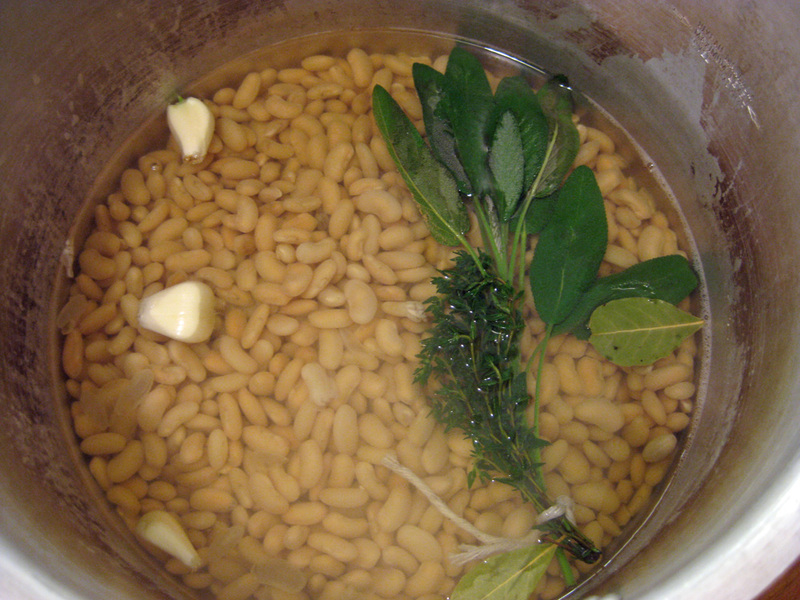 Add the dried navy beans, garlic, bay leaves, sage and thyme to the pressure cooker, with about six cups water. Bring to a boil and cook for about 12-15 minutes. The beans will not be fully cooked. Reduce pressure and add the cheese rinds. Bring back to a boil and pressure cook for another 10-15 minutes. Reduce pressure again and remove the cheese rinds. The rinds will be hot so take caution when removing. 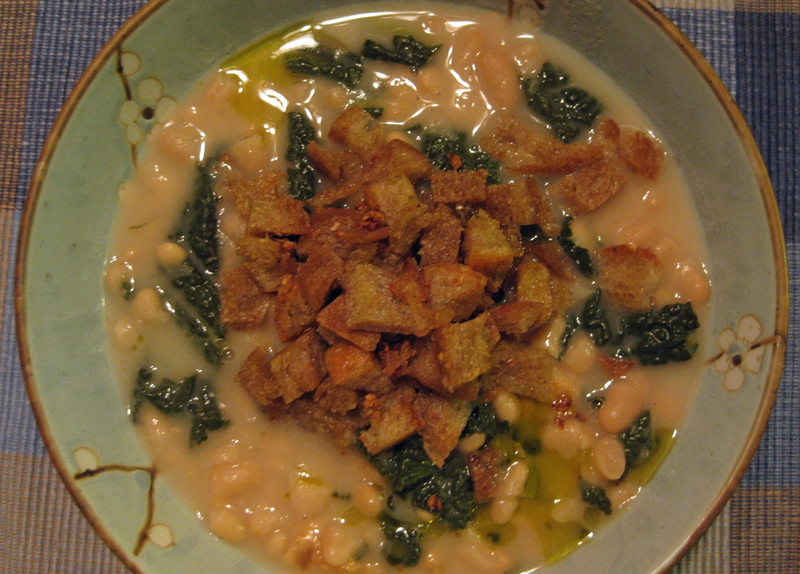 Chop the rinds into small pieces and add them back to the soup. Add the greens and bring to boil and then pressure cook again for about 5-7 minutes. The cheese should mostly be melted but there may be small pieces. Add salt and pepper to taste. The cheese will already add a lot of salt so take caution not to add too much. Make sure to stir after each reduction of the pressure to assure that the cheese does not stick to the bottom of the pot and burn. Serve with a drizzle of good quality extra-virgin olive oil. You can also add croutons or serve with crackers. For a spicy kick add your favorite Tabasco or hot sauce.